Random thought of the day: why doesn't dish washer safe makeup brushes exist? And if they do, where can I get my hands on them?! Is anyone else out there like me and just hate going through the process of cleaning brushes? It's too the point where I literally have a million duplicates just so I can use a clean brush for every application and not have to wash (or spot clean) a brush. Now you may be thinking, just lighten up and use a brush again, but no, I have HUGE pores that get clogged like crazy so better not risk the process more...and naturally I'm acne prone too. Anyhoo, back to the point of today's post which is all about skin care! 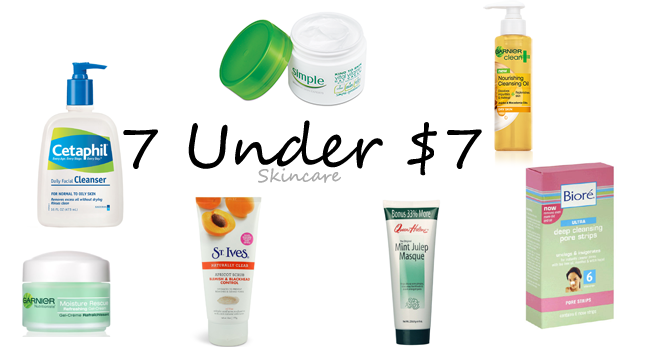 This 7 Under $7 was really difficult for me to put together because I'm obsessed with skincare and have really tried almost everything under the sun. I could easily have made an entire one on facial cleansers alone, but then this series would just go on and on forever so I sat for a very long time and finally whittled it down to my top 7 picks. $7 Garnier Refreshing Gel Cream. If you have ridiculously oily skin like me, this is a must have moisturizer! It feels light and absorbs real fast but keeps my face hydrated all day long. It's also perfect for hot weather because it doesn't feel like it's weighed down on your face. There is formulations for all skin types so definitely one to check out! This definitely makes my holy grail list and I refuse to use anything else. $3 St. Ives Blemish & Blackhead Control Apricot Scrub. This was the holy grail during my horrible pimple years (when I say years, I mean years, which spanned from around the age of 16 to less than a year ago), nothing else worked to banish the oil and make my skin feel normal and clean again. I'm interested in trying their new green tea scrub but I have so many different facial cleansers going right now (see Face Wash Challenge...) I can't justify picking it up just quite yet. $6 Cetaphil Daily Facial Cleanser. This is hands down the best all around cleanser for all skin types. Gentle enough for even the most sensitive skin, this stuff cleans your face like nothing else without stripping it since it is soap free. $6 Biore Deep Cleansing Pore Strips. Depending on where you go you can find these for under $7 but this is a must have for me! These get a lot of flack from some people, but I've always found that it works great. The secret to these is to steam your nose (or take a really steamy shower) beforehand, and follow up with a gentle scrub and rinse with cold water after you take it off. The steam helps to open up the pores a bit so the strip can grip onto the gunk better, and the scrub with cold water helps to get out any residue and tighten up your skin a little while the pores are clean. $4 Queen Helene Mint Julep Masque. This is another great product for my oily acne friends out there. Cleans out your blackheads and leaves your skin feeling so soft and plump, it's a miracle mask with such a budget friendly price! $7 Simple Vital Vitamin Day Cream. This one cheats a little, definitely most places it is over $7 by a few dollars but you can find it for 7 in some places. This is a great basic moisturizer with SPF that protects even the most sensitive skin while providing great hydration all day long. $6 Garnier Cleansing Oil. You didn't really think you could get through an entire skincare tops and not see this guy right? I rave about this all the time, but definitely the BEST makeup remover I have ever used that doubles as a great moisturizer and first step face cleanser. Definitely something you need to check out! What are some of your favorite drugstore skin care essentials?